I'm feeling a mixture of disappointment at being away from the UK and out of the loop while all the News of the World fuss is going on and relief at not being there plugging away doing shifts at some tabloid or other while the tide of public opinion turns against the whole bally lot of us making the job harder than ever when trying to convince whichever person that you're interviewing that day to tell all. It's a strange life, that of a jobbing tabloid hack. Although I was never a paid up staffer I did enough shifts to get a pretty good idea of the brutal pressure it sometimes involves. While thinking about what I would be doing if I were still in the UK, I realised it's actually a pretty strange life I lead here sometimes. Quite a bit of it is taken up with trying to convince people to pay me for the work I've been doing and them telling me that, for some reason or other, it will take four days for someone to issue and sign a cheque that should have been handed over a week ago. This strange life, though, sometimes leads me to be in department stores in Dubai Mall at 11am on a week day. Not buying anything, natch, my budget still doesn't run to that, but being self-employed, if I decide it's time to not work, it's time to not work. This gets balanced out by the fact that I sometimes spend my weekends working when I've got quite a bit on, particularly when him indoors is at work. It also means that when sister of Sand Witch breezed through on a one day visit en route from Singapore to London, I was able to down tools because my main deadline is still weeks away (I love the sound of them as they go whooshing by) and we spent a bit of time pounding the world's biggest shopping mall. It's rather good to have visitors because it does make you realise afresh that even though it's flippin' sweltering hot here at the moment, it is a bizarre, unique and interesting place we live in. 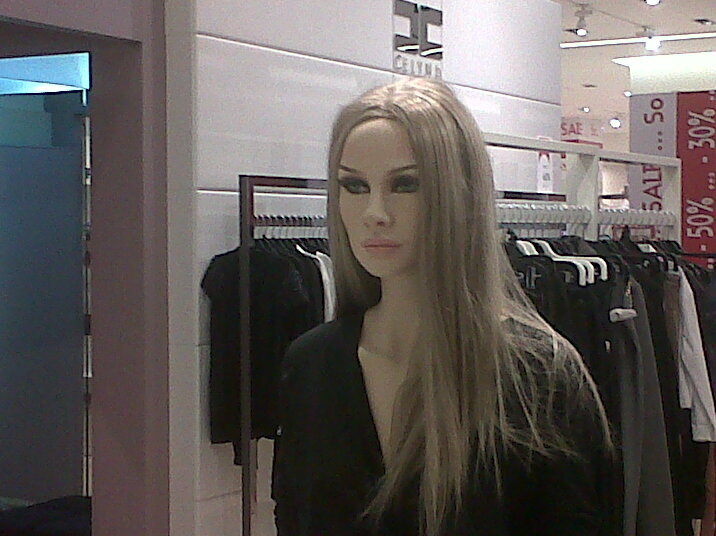 It's not very, bizarre, this, but it got me thinking when I spotted this mannequin while in Galeries Lafayette. Galeries Lafayette, for the uninitiated, is probably the nearest Dubai has to Selfridge's without actually being Selfridge's. What made me snap a pic of her is her trout pout. She resembles, does she not, a cast member of The Only Way is Essex? That and the ironed straight hair designed to resemble dodgy looking extension and four metres of eye makeup suggest that's the look that they're going for. I'm no expert on TOWIE, as I believe you kids call it, as it wasn't shown in Dubai when I first came here and we haven't had a telly since April. But, in those shameful moments when I sneak on to Mail Online, I keep myself abreast of the apparent all encompassing nature of this show. BAFTA-winning no less. And now, the mannequins thousands of miles away from Essex are starting to look like the cast members. It's said that mannequins reflect the women of the time, ie fatter or thinner depending on the fashion. God help us if the TOWIE women are representative of us in the early teenies, or whatever this decade is going to be called.